The formal launch of new guidance, Education for sustainable development: Guidance for UK higher education providers, will take place at Severn Room, Exhibition and Conference Centre, Frenchay Campus, University of the West of England (UWE), Bristol, BS34 8QZ on Friday 17 October 2014, 10.00-16.00. Jointly hosted by The Quality Assurance Agency for Higher Education (QAA), the Higher Education Academy (HEA) and the University of the West of England (UWE), this one-day event will be of interest to programme leaders, teaching staff, institutional managers with responsibility for academic quality, sustainability leaders, and students and their representatives. 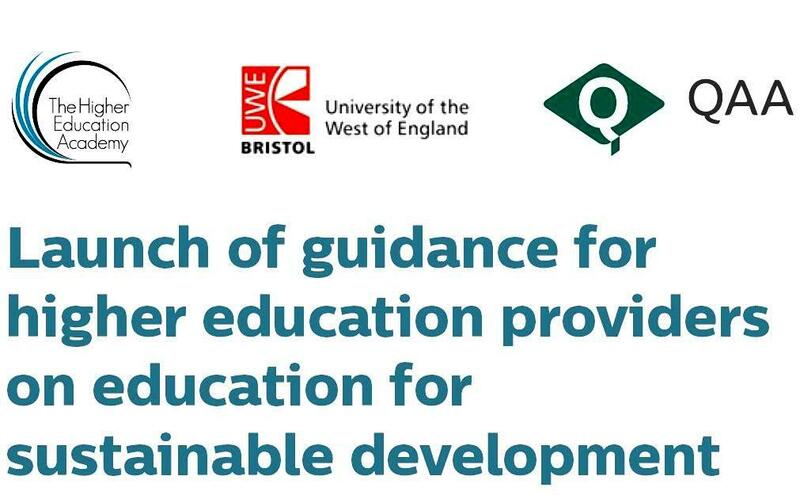 This Education for Sustainable Development (ESD) Guidance, published in June 2014, was developed by QAA working in partnership with the HEA, with the help of an expert advisory group chaired by Professor James Longhurst of UWE and co-convened by Dr Laura Bellingham and Simon Kemp. An earlier version of the guidance was subject to public consultation between November 2013 and January 2014. Following an introduction to the day by Professor Jim Longhurst (Chair of the QAA/HEA ESD Group and Assistant Vice-Chancellor for Environment and Sustainability UWE), Professor Steve West (Vice-Chancellor, UWE) will welcome the delegates. The morning will be structured around two panel presentation/discussion sessions. Panel one will introduce the purpose and expected use of the guidance, and panel two will be a respondents’ panel of academic users, professional body and student representatives. In the afternoon parallel workshops will give the delegates an opportunity to explore working with the new guidance within their own institutional context. They will be able to select a workshop depending on where their institution is in its ESD journey, i.e. starting to address ESD, some way along in its ESD journey, or more advanced in its ESD activity. Each workshop will be facilitated by a member of the QAA/HEA ESD Group. The event will come to a close with feedback from the workshops and conclusions from the day. Although it relates primarily to undergraduate provision and assessment at Level 6, the guidance may also be helpful to educators working at other levels (e.g. Level 5, including foundation degrees, and postgraduate). Moreover, it should be read in conjunction with the appropriate QAA subject benchmark statement. Chapter B3 of the UK Quality Code for Higher Education (the Quality Code) on Learning and Teaching identifies education for sustainability (or ESD) as an educational theme that cuts across academic disciplines. This guidance therefore complements the Quality Code but does not form an explicit part of it. There is no charge to attend this event. Register online (see link below) to attend the event by Friday 10 October 2014. Image adapted from the PDF flier of the event.